Zebronics has launched a new portable tower speaker called Blaster. Priced at Rs. 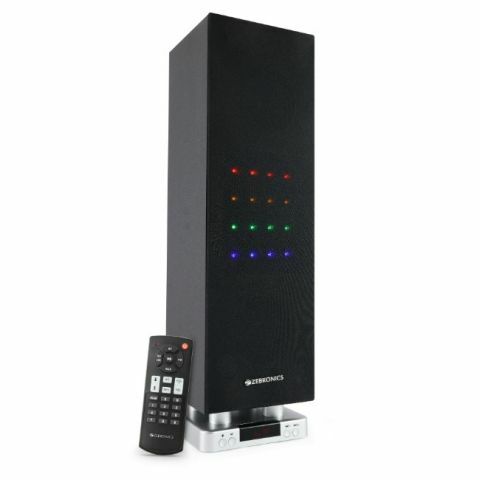 2,499, the speaker comes with embedded LED lights and offers 10W Total RMS Power. It also comes with Bluetooth connectivity as well as a support for AUX, MicroSD, and USB. The Zebronics Blaster also comes with a remote control. Zebronics India Pvt. Ltd, India’s leading supplier of IT peripherals, Audio/Video and Surveillance products, well known for its growing audio range, unveils its latest, Blaster – Portable Tower Speaker. Worthy of its name, Blaster engineered for exceptional sound performance; and an intense audio experience; raises your bar of sound excellence all in elegance. Sporting a super sleek design, Blaster at first glance, appears to be all packed compact with the room filling sound. It has embedded LED Lights that complements your home décor while letting you experience every detail of the sound. With its futuristic design and sound, Blaster promises to stand out from every Tower Speaker in the market with the best budgeted price. Outfitted with the powerful, 10W Total RMS Power, Blaster has been designed for music enthusiasts looking for that edge of innovation, with its portable design and wireless bluetooth music streaming, you can take your music with you. Enabled with Bluetooth, Blaster allows seamless connectivity with mobile phones, Laptops, PC or any other Bluetooth enabled devices with range of 10 meters, this mean that you can enjoy immersive non stop sound with no compromise. But that’s not all, making sure you never run out of options for entertainment, Blaster allows you to play music from multiple sources with AUX, Micro SD, USB Support. Take control with just a finger, furnished with a slim and smart remote controller, blaster gives you complete wireless control. Adjust volume, play, pause, stop and more, easily with this functional yet powerful Remote control that comes along with the speaker. Furthermore, it also comes with FM Playback support letting you tune into your favorite radio station and that lets you play non-stop Music in high quality.